"By God's assistance, the formation of Liwa al-Mu'ammal li-Himayat al-Maqdasat fi Souriya wa Iraq has been completed with the Rapid Intervention Regiment in Iraq and Syria. Let it be known that Liwa al-Mu'ammal is not affiliated with other factions like Asa'ib Ahl al-Haq, Kata'ib Hezbollah and Badr Organization. 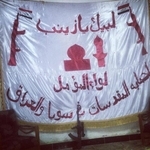 Liwa al-Mu'ammal is independent. Its aim is to protect our people in Iraq and the Ahl al-Bayt [Prophet Muhammad's family] (upon them be peace)." 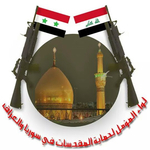 It would thus seem that Liwa al-Mu'ammal is largely a front group for the Rapid Intervention Regiment, another Shi'a militia that has deployed to Iraq and Syria. Some claimed areas of operation include Samarra (which has Shi'a holy sites) and north Babil province.